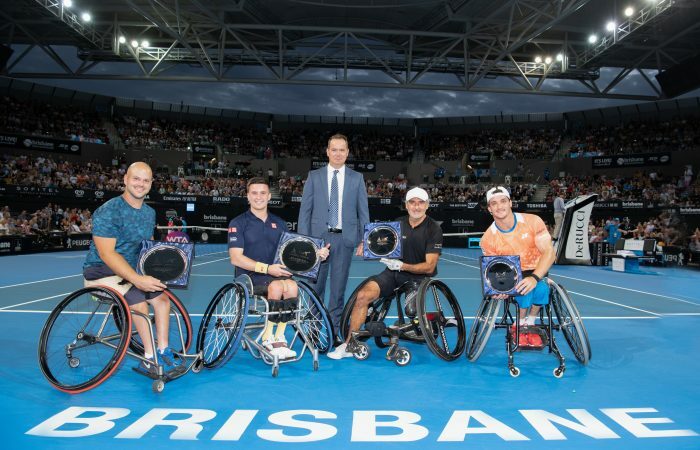 The Brisbane International Festival of Wheelchair Tennis was held over the 4th and 5th January as six elite, internationally ranked players competed in a Men’s Doubles tournament. The competition showcased the world’s best talent over the two days with it finalizing with a Pat Rafter Arena Exhibition Match by all players in front of a capacity crowd before the semi-finals proceedings on 5th January. The playing field comprised of Stephane Houdet (FRA), winner of 4 Grand Slam singles and 19 Grand Slam doubles titles, Stefan Olsson (SWE), the reigning Wimbledon singles champion and Gordon Reid (GBR) holder of 11 Grand Slam titles will play in the men’s doubles tournament over two days at the Brisbane International. Twenty four year old Gustavo Fernandez (ARG) is the highest ranked and youngest player in the world’s top 10 to enter the tournament (WR 3). He will play alongside Maikel Scheffers (NED), a former Australian Open Champion and Australia’s top ranked player doubles player and Australian champion, Ben Weekes (AUS). To add to the experience the community will have the chance to participate and engage with the players in a Come and Try and Run and Roll experience, which combines the rules of wheelchair, and able-bodied tennis so all abilities can share, play and compete together. The entertainment didn’t end there though. Six times singles Wheelchair Grand Slam champion, Dylan Alcott and Rio Paralympic Gold Medallists, Heath Davidson where both in attendance providing support for participants at the various community participation events and even provided the fans with an exhibition match. International Day of People with Disability (IDPwD) is a United Nations sanctioned day held each year on 3 December. It is a day that aims to increase public awareness, understanding and acceptance of people with disability and celebrating their achievements.